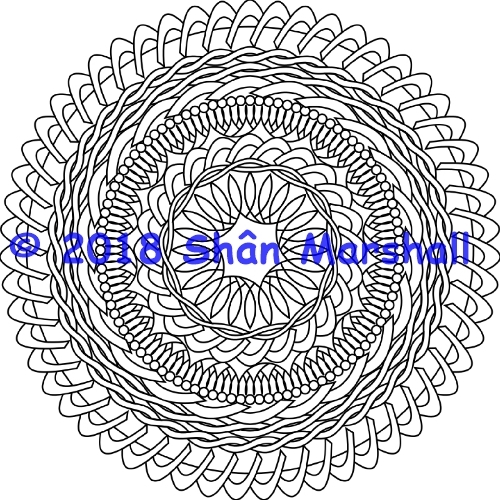 Whether you color for meditation or as hobby, this intricate mandala from the Coloring for Grown-Ups series will keep you occupied for hours. Get in touch with inner child and do coloring together. Designed to be challenging yet therapeutic. Can't beat a bit of art therapy! Twists, half moons and leaves, this may look easy-peasy but once you start you'll see how complex each twist and turn is. Lots of big spaces coupled with many challenging tiny spaces. Will you get your sharpies in? Probably not but it is a cracking mandala for gel pens! Coloring pencils and gel pens recommended. Comes in PDF so you can print off as many times as you want.